This title is about England's forgotten Queen. England, 1469. 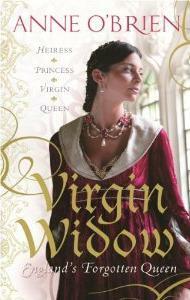 A daughter of Warwick the Kingmaker, Anne Neville cannot dictate her own future. Her marriage will be political, made purely to advance her family's interests. But at the age of fourteen, her father's treason forces her into exile, and into an uneasy betrothal with Edward of Lancaster. Edward is changeable and completely controlled by his powerful mother, Margaret of Anjou. In a hostile, impoverished court, Anne finds herself at the mercy of other's whims. On her wedding night, the audience assembled to witness her bedding instead witnesses a royal humiliation. At the point of consummation, Queen Margaret forbids the act. Anne went to her husband's bed a virgin, and she will remain so. The battle for the crown of England rages, and Anne's husband must fight for his cause. But he is foully done to death by Richard, Duke of Gloucester - a man who twice before has been betrothed to Anne. Anne must decide where her loyalties lie. And during the reign of King Edward, the wrong decision could mean death.